Our annual staff awards ceremony proved a great success, with particular tributes given to those who help bereaved families and those who care for patients with learning disabilities in our hospitals. Tight controls have been in place regarding staff recruitment and the Trust has been successful in its recruitment in most staff groups. The cohort approach to recruiting Healthcare Assistants has continued to prove especially successful. Turnover of staff has remained constant at around 14%. The Trust has a dedicated Carer Support Co-ordinator, who is responsible for providing information to all staff who have caring responsibilities, including childcare and care for an elderly relative or partner. She works to support and advise all local NHS employees on any childcare-related issues. The Trust has two on-site nurseries with 94 places in total. The Trust already runs a childcare voucher scheme and is consulting staff on the possibility of a salary sacrifice scheme for workplace nurseries, whereby parents using the Trust's on-site nurseries can choose to pay an unlimited amount from their salaries to pay for the fees, thus saving money on tax and NI. The Trust provides in-house Occupational Health services, which are available to all staff and which are supplemented by a confidential counselling service. This year has also seen further developments to support Health and Safety practice within the Trust. West Hertfordshire Hospitals NHS Trust is committed not only to ensuring that all of its services are accessible, appropriate and fair, but also to recruiting a diverse workforce, matching the diversity of the local population and being capable of understanding the needs and cultures of patients within the communities it serves. The Trust aims to maintain a balance between the needs and well being of the organisation, its employees, the community and its stakeholders. 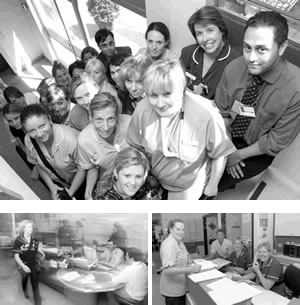 Thus, at West Hertfordshire Hospitals NHS Trust, we are committed to treating everyone with respect and dignity, and to delivering equality of opportunity for all staff, patients and other service users. The Trust is now developing the Disability Equality Scheme, working collaboratively with other Equalities Leads in Hertfordshire, to manage the external consultation process and to enable better involvement of disabled people. The Trust is also developing a policy to support the Age legislation that is due to come into force later this year. Work will begin on the Gender Equality Scheme for April 2007.